Mount Kenya is the highest mountain in Kenya and the second-highest in Africa, after Kilimanjaro. The highest peaks of the mountain are Batian (5,199 metres (17,057 ft)), Nelion (5,188 metres (17,021 ft)) and Point Lenana (4,985 metres (16,355 ft)). Mount Kenya is located in the former Eastern and central provinces of Kenya, now Meru, Embu, Laikipia, Kirinyaga, Nyeri and Tharaka Nithi counties, about 16.5 kilometres (10.3 mi) south of the equator, around 150 kilometres (93 mi) north-northeast of the capital Nairobi. Mount Kenya is the source of the name of the Republic of Kenya. Mount Kenya is a stratovolcano created approximately 3 million years after the opening of the East African rift. Before glaciation, it was 7,000 m (23,000 ft) high. It was covered by an ice cap for thousands of years. This has resulted in very eroded slopes and numerous valleys radiating from the centre. There are currently 11 small glaciers. The forested slopes are an important source of water for much of Kenya. Mount Kenya National Park, established in 1949, protects the region surrounding the mountain. Currently the national park is within the forest reserve which encircles it. In April 1978 the area was designated a UNESCO Biosphere Reserve. The national park and the forest reserve, combined, became a UNESCO World Heritage Site in 1997. The Government of Kenya had four reasons for creating a national park on and around Mount Kenya. These were the importance of tourism for the local and national economies, preserve an area of great scenic beauty, conserve the biodiversity within the park and to preserve the water catchment for the surrounding area. Kenya's government has announced a project to discourage animals from straying into small holdings surrounding the Park and devastating crops. The project will see the Park enclosed by an electric fence with five electrified strands and is expected to be completed by 2014. The fence will discharge an electric shock, but is not dangerous to humans or animals. Mount Kenya is important to all the ethnic communities living around it. The main ethnic groups living around Mount Kenya are Kikuyu, Ameru, Embu and Maasai. The first three are closely related. They all see the mountain as an important aspect of their cultures. All these cultures arrived in the Mount Kenya area in the last several hundred years. The Kikuyu live on the southern and western sides of the mountain. They are agriculturalists, and make use of the highly fertile volcanic soil on the lower slopes. They believe that God, Ngai or Mwene Nyaga, lived on Mount Kenya when he came down from the sky. They believe that the mountain is Ngai's throne on earth. It is the place where Gĩkũyũ, the father of the tribe, used to meet with God. Thus according to the Kikuyu records, Gĩkũyũ is the first person on Earth to ascend the mountain. 'Mwene Nyaga' in Kikuyu language can also translate as the "Owner of the Striped one" where 'Mwene' translates to 'owner', and 'Nyaga' to Stripes. The snow (in Kikuyu: Ira) caps of the mountain symbolically represent a crown on God's habitation . 'Nyaga' can also translate to 'Ostrich'. In this context, God is seen to be the owner of that very rare bird the Ostrich. Kikuyu used to build their houses with the doors facing the mountain. The Kikuyu name for Mount Kenya is Kĩrĩ Nyaga (Kirinyaga), which literally translates to that which has the "Nyaga" – Stripes.The mountain therefore is locally accepted as 'God's Resting Place' or 'Where God Lives'. 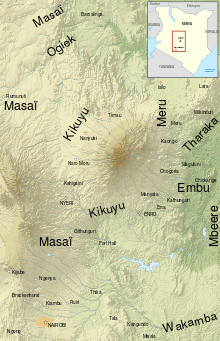 The Embu people live to the south-east of Mount Kenya, and believe that the mountain is God's home (the Embu word for God is Ngai or Mwene Njeru). The mountain is sacred, and they build their houses with the doors facing towards it. The Embu people are closely related to the Ameru and Mbeere people. The Mbeere and Akamba are the settlers of the southeast side of the mountain. The Ameru occupy the east, north and north-western slopes of the mountain. They are generally agricultural and also keep livestock and occupy what is among the most fertile land in Kenya. The Meru god Murungu was from the skies. Their name for Mt. Kenya is Kirimara, which means 'mountain with white features'. Mount Kenya lies in the Kenyan highlands, 150 kilometres (93 mi) north northeast of Nairobi, just northeast of Nyeri. God bless our children, let them be like the olive tree of Morintat, let them grow and expand, let them be like Ngong Hills like Mt. Kenya, like Mt. Kilimanjaro and multiply in number. Mount Kenya was a stratovolcano and probably looked similar to Mt. Fuji (shown above). The lower slopes are still this shape, which is how the previous height is estimated. The central peaks of Mount Kenya are volcanic plugs that have resisted glacial erosion. 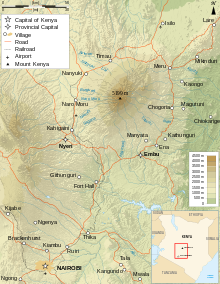 Mount Kenya is a stratovolcano that was active in the Plio-Pleistocene. The original crater was probably over 6,000 m (19,700 ft) high; higher than Kilimanjaro. Since it became extinct there have been two major periods of glaciation, which are shown by two main rings of moraines below the glaciers. 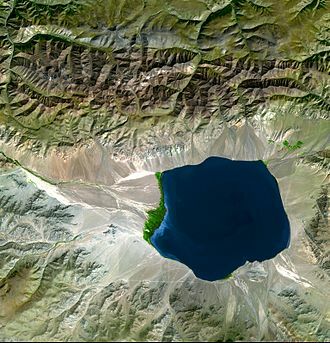 The lowest moraine is found at around 3,300 m (10,800 ft). Today the glaciers reach no lower than 4,650 m (15,260 ft). After studying the moraines, Gregory put forward the theory that at one time the whole summit of the mountain was covered with an ice cap, and it was this that eroded the peaks to how they are today. The lower slopes of the mountain have never been glaciated. They are now mainly cultivated and forested. They are distinguished by steep-sided V-shaped valleys with many tributaries. Higher up the mountain, in the area that is now moorland, the valleys become U-shaped and shallower with flatter bottoms. These were created by glaciation. When Mount Kenya was active there was some satellite activity. The north-eastern side of the mountain has many old volcanic plugs and craters. The largest of these, Ithanguni, even had its own ice cap when the main peaks were covered in ice. This can be seen by the smoothed summit of the peak. Circular hills with steep sides are also frequent in this area, which are probably the remains of small plugged vents. However, as the remaining mountain is roughly symmetrical, most of the activity must have occurred at the central plug. The rocks that form Mount Kenya are mainly basalts, rhomb porphyrites, phonolites, kenytes and trachytes. Kenyte was first reported by Gregory in 1900 following his study of the geology of Mount Kenya. The geology of the Mount Kenya area was first proposed to the Western Community by Joseph Thomson in 1883. He saw the mountain from the nearby Laikipia Plateau and wrote that it was an extinct volcano with the plug exposed. However, as he had only seen the mountain from a distance his description was not widely believed in Europe, particularly after 1887 when Teleki and von Höhnel ascended the mountain and described what they considered to be the crater. In 1893 Gregory's expedition reached the Lewis Glacier at 5,000 m (16,400 ft). He confirmed that the volcano was extinct and that there were glaciers present. The first thorough survey by Europeans was not undertaken until 1966. The main peaks and glaciers of Mount Kenya are near the centre of the mountain. The peaks of Mount Kenya are almost all of a volcanic origin. The majority of the peaks are located near the centre of the mountain. These peaks have an Alpine appearance due to their craggy nature. Typically of Alpine terrain, the highest peaks and gendarmes occur at the intersection of ridges. The central peaks only have a few mosses, lichens and small alpine plants growing in rock crevices. Further away from the central peaks, the volcanic plugs are covered in volcanic ash and soils. The vegetation growing on these peaks is typical for their vegetation band. The highest peaks are Batian (5,199 metres (17,057 ft)), Nelion (5,188 m (17,021 ft)) and Pt Lenana (4,985 m (16,355 ft)). Batian and Nelion are within 250 m (270 yd) of each other, separated by the Gate of the Mists gap (5,144 metres (16,877 ft)). Coryndon Peak (4,960 m (16,273 ft)) is the next highest, but unlike the previous peaks it does not form a part of the central plug. Other peaks around the central plug include Pt Piggot (4,957 m (16,263 ft)), Pt Dutton (4,885 m (16,027 ft)), Pt John (4,883 m (16,020 ft)), Pt John Minor (4,875 m (15,994 ft)), Krapf Rognon (4,800 m (15,748 ft)), Pt Peter (4,757 m (15,607 ft)), Pt Slade (4,750 m (15,584 ft)) and Midget Peak (4,700 m (15,420 ft)). All of these have a steep pyramidal form. 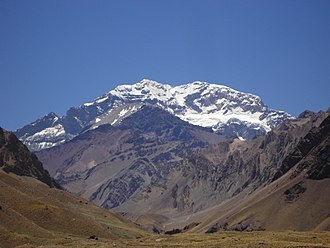 Significant craggy outlying peaks include Terere (4,714 m (15,466 ft)) and Sendeyo (4,704 m (15,433 ft)) which form a pair of twin peaks to the north of the main plug. Together, they form a large parasitic plug. 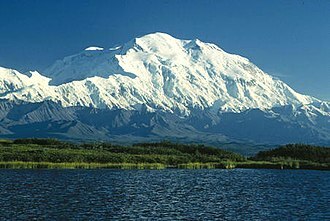 Other notable peaks include The Hat (4,639 m (15,220 ft)), Delamere Peak, Macmillan Peak and Rotundu. Midget peak can be climbed in a day. The glaciers on Mount Kenya are retreating rapidly. The Mountain Club of Kenya in Nairobi has photographs showing the mountain at the time of the first recorded ascent in 1899, and again more recently; the retreat of the glaciers is very evident. Descriptions of ascents of several of the peaks advise on the use of crampons, but this is true only in some cases and at higher heights. Every year there is less new snow accumulating in winter than melting on summer, even on the Lewis Glacier (the largest of them) in winter, so there is no formation of new ice. It is predicted to be less than 30 years before there will no longer be ice on Mount Kenya. Glacial retreat and disappearance can be caused by change in temperature trends, or by change in precipitation trends. The area of glaciers on the mountain was measured in the 1980s, and recorded as about 0.7 km2 (0.27 sq mi). This is far smaller than the first observations, made in the 1890s. Although Mount Kenya is on the equator the freezing nightly temperatures result in periglacial landforms. There is permafrost a few centimetres (inches) below the surface. Patterned ground is present at 3,400 m (11,155 ft) to the west of Mugi Hill. These mounds grow because of the repeated freezing and thawing of the ground drawing in more water. There are blockfields present around 4,000 m (13,123 ft) where the ground has cracked to form hexagons. Solifluction occurs when the night temperatures freeze the soil before it thaws again in the morning. This daily expansion and contraction of the soil prevents the establishment of vegetation. Runoff from Mount Kenya provides water for over 2 million people. Mount Kenya is the main water catchment area for two large rivers in Kenya; the Tana, the largest river in Kenya, and the Ewaso Ng'iso North. The Mount Kenya ecosystem provides water directly for over 2 million people. The rivers on Mount Kenya have been named after the villages on the slopes of the mountain that they flow close to. The Thuchi River is the district boundary between Tharaka Nithi and Embu. Mount Kenya is a major water tower for the Tana river which in 1988 supplied 80% of Kenya's electricity using a series of seven hydroelectric powerstations and dams. The density of streams is very high, especially on the lower slopes which have never been glaciated. The ice cap which used to cover the mountain during the Pliocene eroded large U-shaped valleys which tend to only have one large stream. Where the original shape of the shield volcano is still preserved, there have been millions of years for streams to erode the hillside. This area is therefore characterised by frequent deep fluvial V-shaped valleys. The gradual transition from glaciated to fluvial valley can be clearly observed. Rivers which start on Mount Kenya are the tributaries of two large Kenyan rivers: the Tana and the Ewaso Ng'iro rivers. A lot of Mount Kenyan rivers flow into the Sagana which itself is a tributary of the Tana, which it joins at the Masinga Reservoir. The rivers in the northern part of the mountain, such as the Burguret, Naru Moru, Nanyuki, Liki, Sirimon flow into the Ewaso Ng'iro. The rivers to the south-west, such as the Keringa and Nairobi flow into the Sagana and then into the Tana. The remaining rivers to the south and east, such as the Mutonga, Nithi, Thuchi and Nyamindi, flow directly into the Tana. Mount Kenya has several altitudinal ecological zones, between the savanna surrounding the mountain to the nival zone by the glaciers. Each zone has a dominant species of vegetation. Many of the species found higher up the mountain are endemic, either to Mount Kenya or East Africa. There are also differences within the zones, depending on the side of the mountain and aspect of the slope. The south-east is much wetter than the north, so species more dependent on moisture are able to grow. Some species, such as bamboo, are limited to certain aspects of the mountain because of the amount of moisture. There are distinct vegetation zones around Mount Kenya which vary according to altitude and aspect. The climate of Mount Kenya changes considerably with altitude, forming belts of community types. Around the base of the mountain is fertile farmland. The tribes living around the mountain have cultivated this cool relatively moist area for centuries. Mount Kenya is surrounded by forests. 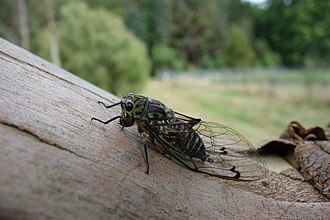 The vegetation in the forests depend on rainfall, and the species present differ greatly between the northern and southern slopes. As time has passed the trees on the edge of the forest have been logged and the farmland has encroached further up the fertile slopes of the mountain. Above the forest is a belt of bamboo. This zone is almost continuous, but is restricted to small isolated bunches in the north because of low rainfall. The bamboo is natural, and does not require forest disturbance. Tracks are common through the bamboo. Bamboo suppresses other vegetation, so it is uncommon to find trees or other plants here. The timberline forest is commonly in cloud. The trees are relatively small and covered in lichens and mosses. Above the bamboo is the timberline forest. The trees here are often smaller than the trees in the forests lower down the mountain. The forest here is more intact, because it is less accessible and better protected. When the trees can no longer grow the vegetation changes into heathland and chaparral, at around 3,000 m (9,800 ft). Heathland is found in the wetter areas, on the west side of Mount Kenya, and is dominated by giant heathers. Chaparral is found in the drier areas and grasses are more common. and bush fires still occur. As the altitude increases the temperature fluctuations become extreme and the air becomes thinner and drier. This region is known as the Afro-alpine zone. The environment here is isolated, with the only similar area nearby being the Aberdares, which are 80 km (50 mi) away. Many of the species here are endemic, with adaptations to the cold and fluctuating temperatures. Typical plants here include giant groundsels (senecios) and giant lobelias. The region where the glaciers have recently retreated from is nival zone. It is the area that plants have not yet been able to colonise. Many plants that live on Mount Kenya, like this Senecio keniodendron, have to be specially adapted to the extremes in temperature. The flora found on Mount Kenya varies with altitude, aspect and exposure. As the altitude increases, the plants have to be more specialised, with adaptations to strong sunlight with ultraviolet, lower mean temperatures and freezing night temperatures. Plants in the Afro-alpine zone have overcome these difficulties in several ways. One adaptation is known as the giant rosette, which is exhibited by giant senecio, giant lobelia and giant thistle (Carduus), which use bud leaves to protect their buds from freezing. Giant rosette senecios form single-aged stands that drive community structure over decades. 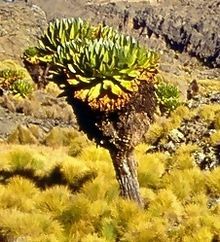 Many plant species in the Afro-alpine zone of Mount Kenya are giant versions of lowland (or temperate) relatives. However, nearer the nival zone the plants decrease in size again. Hyrax are able to cope with a more extreme climate and are found up to the highest elevation. Safari ants swarm around the forest in long columns. They are easiest to see when they cross the tracks. Several bird species live in the Afro-alpine zone, including sunbirds, alpine chats and starlings and the raptors, augur buzzard, lammergeier and Verreaux's eagle, the latter of which specializes in hunting hyraxes. Birds are important in this ecosystem as pollinators. The climate of Mount Kenya has played a critical role in the development of the mountain, influencing the topography and ecology amongst other factors. It has a typical equatorial mountain climate which Hedberg described as winter every night and summer every day. Mount Kenya is home to one of the Global Atmosphere Watch's atmospheric monitoring stations. In January the Intertropical Convergence Zone is at its southern extreme over the Indian Ocean. In July it is at its northern extreme over Tibet and Arabia. As it passes over the equator, Mount Kenya experiences a wet season. The year is divided into two distinct wet seasons and two distinct dry seasons which mirror the wet and dry seasons in the Kenyan lowlands. As Mount Kenya ranges in height from 1,374 m (4,508 ft) to 5,199 m (17,057 ft) the climate varies considerably over the mountain and has different zones of influence. The lower, south eastern slopes are the wettest as the predominant weather system comes from the Indian ocean. This rainfall supports dense montane forest on these slopes. High on the mountain most of the precipitation falls as snow. Combined, these water sources feed 11 glaciers. The current climate on Mount Kenya is wet, but drier than it has been in the past. The temperatures span a wide range, which diminishes with altitude. In the lower alpine zone temperature usually do not go below 12 °C (54 °F). 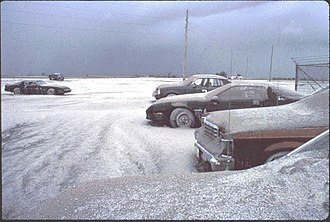 Snow and rain are common from March to December, but especially in the two wet seasons. 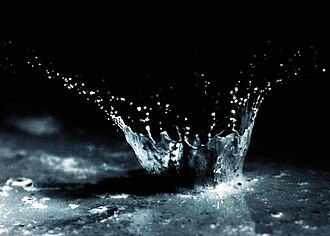 The wet seasons combined account for 5/6 of the annual precipitation. The monsoon, which controls the wet and dry seasons, means that most of the year there are south-easterly winds, but during January and February the dominant wind direction is north-easterly. Mount Kenya, like most locations in the tropics, has two wet seasons and two dry seasons as a result of the monsoon. From mid-March to June the heavy rain season, known as the long rains, brings approximately half of the annual rainfall on the mountain. This is followed by the wetter of the two dry seasons which lasts until September. October to December are the short rains when the mountain receives approximately a third of its rainfall total. Finally from December to mid-March is the drier dry season when the mountain experiences the least rain. During the dry season the mountain almost always follows the same daily weather pattern. Large daily temperature fluctuations occur which led Hedberg to exclaim winter every night and summer every day. There is variation in minimum and maximum temperatures day to day, but the standard deviation of the mean hourly pattern is small. In the dry season, mornings are typically clear and cool, but the mountain is hidden in cloud by mid-day. A typical day is clear and cool in the morning with low humidity. The mountain is in direct sunlight which causes the temperatures to rise quickly with the warmest temperatures occurring between 0900 and 1200. This corresponds to a maximum in the pressure, usually around 10 am. Low on the mountain, between 2,400 m (7,874 ft) and 3,900 m (12,795 ft), clouds begin to form over the western forest zone, due to moist air from Lake Victoria. The anabatic winds caused by warm rising air gradually bring these clouds to the summit region in the afternoon. Around 1500 there is a minimum in sunlight and a maximum in humidity causing the actual and perceived temperature to drop. At 1600 there is a minimum in the pressure. This daily cover of cloud protects the glaciers on the south-west of the mountain which would otherwise get direct sun every day, enhancing their melt. The upwelling cloud eventually reaches the dry easterly air streams and dissipates, leading to a clear sky by 5 pm. There is another maximum of temperature associated with this. Being an equatorial mountain the daylight hours are constant with twelve-hour days. Sunrise is about 0630 with the sun setting at 1830 (both EAT = UTC+3). Over the course of the year there is a one-minute difference between the shortest and longest days. At night, the sky is usually clear with katabatic winds blowing down the valleys. Above the lower alpine zone there is usually frost every night. 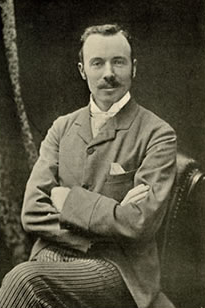 Joseph Thomson reached the foothills of Mount Kenya and confirmed Krapf's discovery. The first European to report seeing Mount Kenya was Dr Johann Ludwig Krapf, a German missionary, from Kitui, a town 160 km (100 mi) away from the mountain. The sighting was made on 3 December 1849, a year after the first sighting of mount Kilimanjaro by a European. Krapf was told by people of the Embu tribe that lived around the mountain that they did not ascend high enough on the mountain because of the intense cold and the white matter that rolled down the mountains with a loud noise. This led him to infer that glaciers existed on the mountain. It was Krapf who gave the mountain the name "Kenya", but the derivation of this is not known with certainty (see the various local names below, some of which are similar). 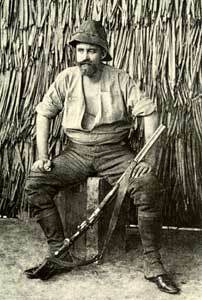 Count Samuel Teleki was the first European to set foot on Mount Kenya. 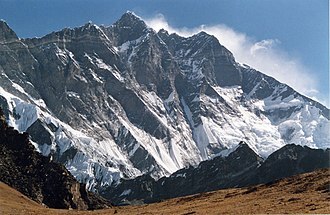 His expedition reached 4,350 m (14,270 ft). Krapf also noted that the rivers flowing from Mount Kenya, and other mountains in the area, were continuously flowing. This was very different from the other rivers in the area, which swelled up in the wet season and completely dried up after the rainy season had ended. As the streams flowed even in the driest seasons he concluded that there must be a source of water up on the mountain, in the form of glaciers. He believed the mountain to be the source of the White Nile. In 1851 Krapf returned to Kitui. He travelled 65 kilometres (40 mi) closer to the mountain, but did not see it again. In 1877 Hildebrandt was in the Kitui area and heard stories about the mountain, but also did not see it. Since there were no confirmations to back up Krapf's claim people began to be suspicious. Eventually, in 1883, Joseph Thomson passed close by the west side of the mountain and confirmed Krapf's claim. He diverted his expedition and reached 1,737 m (5,700 ft) up the slopes of the mountain but had to retreat because of trouble with local people. However, the first European exploration high onto the mountain was achieved in 1887 by Count Samuel Teleki. He managed to reach 4,350 m (14,270 ft) on the south western slopes. On this expedition Teleki mistakenly believed he had found the crater of a volcano. In 1892, Teleki and von Höhnel returned to the eastern side, but were unable to get through the forest. Finally, in 1893, an expedition managed to ascend Mount Kenya as far as the glaciers. This expedition was traveling from the coast to Lake Baringo in the Rift Valley, and was led by Dr John W Gregory, a British geologist. They managed to ascend the mountain to around 4,730 m (15,520 ft), and spent several hours on the Lewis Glacier with their guide. On his return to Britain, Gregory published papers and a narrative account of his achievements. George Kolb, a German physician, made expeditions in 1894 and 1896 and was the first to reach the moorlands on the east side of the mountain. More exploration occurred after 1899 when the Uganda Railway was completed as far as the future site of Nairobi. On 28 July 1899, Sir Halford John Mackinder set out from the site of Nairobi on an expedition to Mount Kenya. The members of the expedition consisted of 6 Europeans, 66 Swahilis, 2 Maasai guides, and 96 Kikuyu. The Europeans were Campbell B. Hausberg, second in command and photographer; Douglas Saunders, botanist; C F Camburn, taxidermist; Cesar Ollier, guide; and Josef Brocherel, guide and porter. The expedition made it as far as the mountain, but encountered many difficulties on the way. The country they passed through was full of plague and famine. 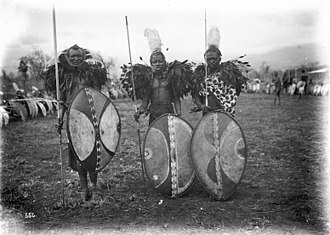 Many Kikuyu porters tried to desert with women from the villages, and others stole from the villages, which made the chiefs very hostile towards the expedition. When they reached the base camp on 18 August, they could not find any food, suffered two of their party killed by the local people, and eventually had to send Saunders to Naivasha to get help from Captain Gorges, the Government Officer there. Mackinder pushed on up the mountain, and established a camp at 3,142 m (10,310 ft) in the Höhnel Valley. He made his first attempt on the summit on 30 August with Ollier and Brocherel up the south east face, but they had to retreat when they were within 100 m (330 ft) of the summit of Nelion due to nightfall. On 5 September, Hausberg, Ollier, and Brocherel made a circuit of the main peaks looking for an easier route to the summit. They could not find one. On 11 September Ollier and Brocherel made an ascent of the Darwin Glacier, but were forced to retreat due to a blizzard. When Saunders returned from Naivasha with the relief party, Mackinder had another attempt at the summit with Ollier and Brocherel. They traversed the Lewis Glacier and climbed the south east face of Nelion. They spent the night near the gendarme, and traversed the snowfield at the head of the Darwin Glacier at dawn before cutting steps up the Diamond Glacier. They reached the summit of Batian at noon on 13 September, and descended by the same route. After the first ascent of Mount Kenya there were fewer expeditions there for a while. The majority of the exploration until after the First World War was by settlers in Kenya, who were not on scientific expeditions. A Church of Scotland mission was set up in Chogoria, and several Scottish missionaries ascended to the peaks, including Rev Dr. J. W. Arthur, G. Dennis and A. R. Barlow. There were other ascents, but none succeeded in summitting Batian or Nelion. New approach routes were cleared through the forest, which made access to the peaks area far easier. In 1920, Arthur and Sir Fowell Buxton tried to cut a route in from the south, and other routes came in from Nanyuki in the north, but the most commonly used was the route from the Chogoria mission in the east, built by Ernest Carr. Carr is also credited with building Urumandi and Top Huts. On 6 January 1929 the first ascent of Nelion was made by Percy Wyn-Harris and Eric Shipton. They climbed the Normal Route, then descended to the Gate of Mists before ascending Batian. On 8 January they reascended, this time with G. A. Sommerfelt, and in December Shipton made another ascent with R. E. G. Russell. They also made the first ascent of Point John. During this year the Mountain Club of East Africa was formed. At the end of July 1930, Shipton and Bill Tilman made the first traverse of the peaks. They ascended by the West Ridge of Batian, traversed the Gate of Mists to Nelion, and descended the Normal Route. During this trip, Shipton and Tilman made first ascents of several other peaks, including Point Peter, Point Dutton, Midget Peak, Point Pigott and either Terere or Sendeyo. In the early 1930s there were several visits to the moorlands around Mount Kenya, with fewer as far as the peaks. Raymond Hook and Humphrey Slade ascended to map the mountain, and stocked several of the streams with trout. By 1938 there had been several more ascents of Nelion. In February, Miss C Carroll and Mtu Muthara became the first woman and African respectively to ascend Nelion, in an expedition with Noel Symington, author of The Night Climbers of Cambridge, and on 5 March Miss Una Cameron became the first woman to ascend Batian. During the Second World War there was another drop in ascents of the mountain. The most remarkable ascent during this period was by three Italians who were being held in a British POW camp at the base of the mountain in Nanyuki. 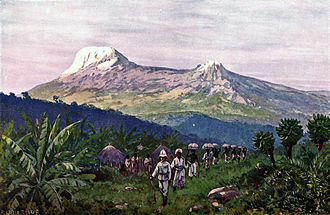 They escaped from camp to climb the mountain's third peak, Point Lenana, before "escaping" back into camp. Felice Benuzzi, the team leader, retold his story in the book No Picnic on Mount Kenya (1946). In 1949 the Mountain Club of Kenya split from the Mountain Club of East Africa, and the area above 3,400 m (11,150 ft) was designated a National Park. A road was built from Naro Moru to the moorlands, allowing easier access. Many new routes were climbed on Batian and Nelion in the next three decades, and in October 1959 the Mountain Club of Kenya produced their first guide to Mount Kenya and Kilimanjaro. 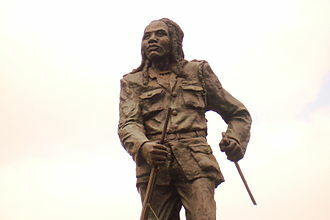 On Kenyan independence in 1963, Kisoi Munyao raised the Kenyan flag at the top of the mountain. He died in 2007 and was given a heroic funeral attended by Kenyan president Mwai Kibaki. In the early 1970s the Mount Kenya National Park Mountain Rescue Team was formed, and by the end of the 1970s all major routes on the peaks had been climbed. On 19 July 2003, a South African registered aircraft, carrying 12 passengers and two crew, crashed into Mount Kenya at Point Lenana; nobody survived. This was not the first aircraft lost on the mountain; there is also the wreckage of at least one helicopter that crashed before 1972. In March 2012 a massive fire raged on Mount Kenya, devouring thousands of hectares of ancient forests and endangered wildlife. When ascended directly, Batian is usually climbed via the North Face Standard Route, UIAA grade IV+ (or 5.6+ YDS). It was first ascended on 31 July 1944 by Firmin and Hicks. The route is usually climbed in two days. The Normal Route is the most climbed route up Nelion, and thence across to Batian. It was first climbed by Shipton and Wyn-Harris on 6 January 1929. It is possible to traverse between the two peaks, via the Gates of Mist, but this often involves spending a night in the Howell hut on top of Nelion. There is a bolted abseil descent route off Nelion. Mount Kenya's climbing seasons are a result of its location only 20 km (12 mi) from the equator. During the northern summer the rock routes on the north side of the peak are in good summer condition, while at the same time the ice routes on the south side of the peak are prime shape. The situation is reversed during the southern summer. The two seasons are separated by several months of rainy season before and after, during which climbing conditions are generally unfavorable. 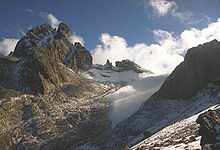 Mount Kenya is home to several good ice routes, the two most famous being the Diamond Couloir and the Ice Window route. Snow and ice levels on the mountain have been retreating at an accelerated rate in recent years, making these climbs increasingly difficult and dangerous. The Diamond Couloir, a steep ice couloir fed by the fusion of the upper Diamond Glacier and pioneered in 1975 by Yvon Chouinard and Michael Covington, was once climbable in summer or winter but now is virtually unclimbable in summer conditions and is seldom deemed in climbable condition even in winter. Last climbing reports describe the route very difficult, especially in the lower section. The route has changed into a modern ice climb with a very difficult 60m first pitch, starting with 8m of overhanging M7 dry tooling, followed by 50m of USA Grade V ice and by others 6 pitches of moderate climbing on good ice and finally one pitch of water ice USA Grade IV+ ice at the headwall before getting to the Upper Diamond Glacier. The satellite peaks around the mountain also provide good climbs. These can be climbed in Alpine style and vary in difficulty from a scramble to climbing at UIAA grade VI. They are useful for acclimatisation before climbing the higher peaks and as ascents in their own right. There are eight walking routes up to the main peaks. Starting clockwise from the north these are the: Meru, Chogoria, Kamweti, Naro Moru, Burguret, Sirimon and Timau Routes. Of these Chogoria, Naro Moru and Sirimon are used most frequently and therefore have staffed gates. The other routes require special permission from the Kenya Wildlife Service to use. The Chogoria route leads from Chogoria town up to the peaks circuit path. It heads through the forest to the south-east of the mountain to the moorland, with views over areas such as Ithanguni and the Giant's Billiards Table before following the Gorges Valley past the Temple and up to Simba Col below Point Lenana. The Mountain Club of Kenya claims that Ithanguni and the Giant's Billiards Table offer some of the best hillwalking in Kenya. The Naro Moru route is taken by many of the trekkers who try to reach Point Lenana. It can be ascended in only 3 days and has bunkhouses at each camp. The route starts at Naro Moru town to the west of the mountain and climbs towards Mackinder's Camp before joining the Peak Circuit Path. The terrain is usually good, although one section is called the Vertical Bog. The Sirimon route approaches Mount Kenya from the north-west. The path splits on the moorlands, with the more frequently used fork following the Mackinder Valley and the quieter route traversing into the Liki North Valley. The paths rejoin at Shipton's Cave just below Shipton's Camp on the Peak Circuit Path. The Peak Circuit Path is a path around the main peaks, with a distance of about 10 kilometres (6 mi) and height gain and loss of over 2,000 metres (6,600 ft). It can be walked in one day, but more commonly takes two or three. It can also be used to join different ascent and descent routes. The route does not require technical climbing. The Gorges Valley is a major feature on the Chogoria Route. Vertical bog on Mount Kenya on the Naro Moru Route. Looking towards the peaks up the Mackinder Valley on the Sirimon Route. 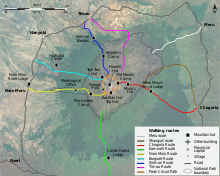 Development is currently underway for a new route up the mountain starting from the Ragati conservancy and running up the ridge between the Naro Moru route and the old Kamweti trail. Accommodation on Mount Kenya ranges from very basic to luxurious. The more luxurious lodges are found on the lower slopes, in and around the forest. These lodges have hotel-style accommodation, often with log fires and hot running water. Many offer guided walks and other activities such as fishing and birdwatching. The huts higher on the mountain are more basic. Most have several bunkrooms with beds, and also offer somewhere to rest, cook and eat. Some also have running water. A few huts are very basic bothies and offer only a space to sleep that is sheltered from the weather. Beds in the huts can be reserved at the park gates. Camping is allowed anywhere in the National Park, but it is most encouraged around the huts to limit environmental impact. It is possible for campers to use the communal spaces in the huts for no extra fee. Austrian Hut is found near the Lewis Glacier on the slopes of Point Lenana. The hut sleeps 30 people, with Top Hut nearby for porters. Liki North Hut is a small bothy in the Liki North Valley. It offers little more than shelter from the weather. Shipton's Camp is at the top of the Sirimon Route. It has a large communal area and running cold water. Camping is allowed anywhere within the National Park. Fairmont Mount Kenya Safari Club is a resort located in Nanyuki at the base of Mount Kenya. The resort has over 120 rooms and is one of the most exclusive in the region. The origin of the name Kenya is not clear, but perhaps linked to the Kikuyu, Embu and Kamba words Kirinyaga, Kirenyaa and Kiinyaa which mean "God's resting place" in all three languages. In the 19th Century, the German explorer, Ludwig Krapf, recorded the name as both Kenia and Kegnia believed by some to be a corruption of the Kamba version. Others however say that this was on the contrary a very precise notation of the correct African pronunciation /ˈkɛnjə/. In any case, the name was for a long time pronounced by colonial-heritage Europeans as /ˈkiːnjə/. The European pronunciation has been abandoned in modern times, in favor of the African version. The peaks of Mount Kenya have been given names from three different sources. Firstly, several Maasai chieftains have been commemorated, with names such as Batian, Nelion and Lenana. They commemorate Mbatian, a Maasai Laibon (Medicine Man), Nelieng, his brother, and Lenana and Sendeyo, his sons. Terere is named after another Maasai headman. The second type of names that were given to peaks are after European climbers and explorers. Some examples of this are Shipton, Sommerfelt, Tilman, Dutton and Arthur. The remaining names are after well-known Kenyan personalities, with the exception of John and Peter, which were named by the missionary Arthur after two disciples. There is a group of four peaks to the east of the main peaks named after European settlers; Coryndon, Grigg, Delamere and McMillan. ^ a b c "Africa Ultra-Prominences" Peaklist.org. Retrieved 2012-02-06. 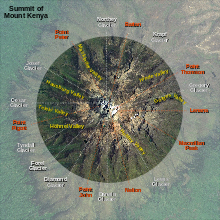 ^ "Mount Kenya Map Sample". Ewpnet.com. Archived from the original on 21 August 2010. Retrieved 16 April 2010. ^ a b c d e f g h i j k l m n o Mount Kenya Map and Guide (Map) (4th ed.). 1:50,000 with 1:25,000 inset. EWP Map Guides. Cartography by EWP. EWP. 2007. ISBN 978-0-906227-96-1. Archived from the original on 27 February 2009. ^ a b c d Rough Guide Map Kenya (Map) (9 ed.). 1:900,000. Rough Guide Map. Cartography by World Mapping Project. Rough Guide. 2006. ISBN 1-84353-359-6. ^ Philippe Nonnotte. "Étude volcano-tectonique de la zone de divergence Nord-Tanzanienne (terminaison sud du rift kenyan) – Caractérisation pétrologique et géochimique du volcanisme récent (8 Ma – Actuel) et du manteau source – Contraintes de mise en place thèse de doctorat de l'université de Bretagne occidentale, spécialité : géosciences marines" (PDF). ^ a b Gregory, J. W. (1894). "Contributions to the Geology of British East Africa.-Part I. The Glacial Geology of Mount Kenya". Quarterly Journal of the Geological Society. 50: 515–530. doi:10.1144/GSL.JGS.1894.050.01-04.36. ^ a b c d e f g Baker, B. H. (1967). Geology of the Mount Kenya area. Nairobi: Geological Survey of Kenya. ^ a b c d e f Gichuki, Francis Ndegwa (August 1999). "Threats and Opportunities for Mountain Area Development in Kenya". Ambio. 28 (5): 430–435. Archived from the original (subscription required) on 31 December 2005. ^ Resnick, Mike (1998). Kirinyaga: a fable of Utopia. Ballantine. p. 293. ISBN 978-0-345-41701-5. ^ a b c d e f g h i j Coe, Malcolm James (1967). The Ecology of the Alpine Zone of Mount Kenya. The Hague: Dr W. Junk. ^ a b United Nations (2008). "Mount Kenya National Park/Natural Forest". Archived from the original on 30 December 2006. Retrieved 23 February 2008. ^ "World Heritage Nomination – IUCN Technical Evaluation Mount Kenya (Kenya)" (PDF). ^ Kenya Wildlife Service. "Mount Kenya National Park". Archived from the original on 25 January 2010. Retrieved 30 December 2009. ^ UNESCO (1998). "Biosphere Reserve Information – Mount Kenya". Retrieved 6 November 2016. ^ "Mt Kenya to get electric fence to stop wildlife straying". BBC News. Bbc.co.uk. 7 September 2012. Retrieved 11 September 2013. ^ Kenyatta, Jomo (1961). Facing Mount Kenya. London: Secker and Warburg. ISBN 978-0-435-90219-3. ^ a b Somjee, Sultan (2000). "Oral Traditions and Material Culture: An East Africa Experience". Research in African Literatures. 31 (4): 97–103. doi:10.2979/RAL.2000.31.4.97. Retrieved 21 February 2008. ^ a b c d e Baker, B. H. (1967). Geology of the Mount Kenya Area. Geological Survey of Kenya. Ministry of Natural Resources. ^ a b Gregory, J. W. (1900). "Contributions to the Geology of British East Africa. Part II. The Geology of Mount Kenya". Quarterly Journal of the Geological Society. 56: 205–222. doi:10.1144/GSL.JGS.1900.056.01-04.12. ^ a b Thomson, Joseph (1968) . 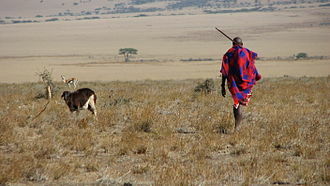 Through Masai Land (3 ed.). London: Frank Cass & Co Ltd. ISBN 978-1-141-95717-0. ^ a b c Gregory, John Walter (1968) . The Great Rift Valley. London: Frank Cass & Co. Ltd. ISBN 978-0-7146-1812-8. ^ Speck, Heinrich (1982). "Soils of the Mount Kenya Area: Their formation, ecology, and agricultural significance". Mountain Research and Development. 2 (2): 201–221. doi:10.2307/3672965. JSTOR 3672965. ^ "Mount Kenya Climbing guide". Ewpnet.com. Archived from the original on 14 February 2008. Retrieved 11 September 2013. ^ a b c d e f g h i j k l m n o p q r s t u v w x y Allan, Iain (1981). The Mountain Club of Kenya Guide to Mount Kenya and Kilimanjaro. Nairobi: Mountain Club of Kenya. ISBN 978-9966-9856-0-6. ^ Mountain Club. "Mountain Club of Kenya Homepage". Retrieved 26 May 2007. 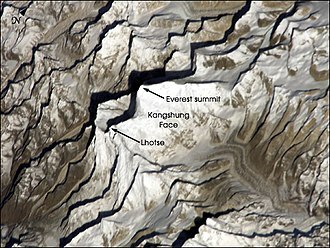 ^ Recession of Equatorial Glaciers. A Photo Documentation Archived 19 March 2012 at WebCite, Hastenrath, S., 2008, Sundog Publishing, Madison, WI, ISBN 978-0-9729033-3-2, 144 pp. ^ Benn, Doug; David, Evans (1997). Glaciers and Glaciation. Arnold. ISBN 978-0-340-58431-6. ^ a b Karlén, Wibjörn; James L Fastook; Karin Holmgren; Maria Malmström; John A Matthews; Eric Odada; Jan Risberg; Gunhild Rosqvist; Per Sandgren; Aldo Shemesh; Lars-Ove Westerberg (August 1999). "Glacier Fluctuations on Mount Kenya since ~6000 Cal. Years BP: Implications for Holocene Climate Change in Africa". Ambio. 28 (5): 409–418. Archived from the original on 31 December 2005. ^ a b Ojany, Francis F. (1993). "Mount Kenya and its environs: A review of the interaction between mountain and people in an equatorial setting". Mountain Research and Development. 13 (3): 305–309. doi:10.2307/3673659. JSTOR 3673659. ^ a b Mt Kenya 1:50000 Map and Guide (Map) (1 ed.). 1:50000 with 1:25000 inset. Cartography by West Col Productions. Andrew Wielochowski and Mark Savage. 1991. ISBN 0-906227-39-9. ^ a b Hedberg, Olov (1951). "Vegetation belts of East African mountains". Svensk Bot. Tidskr. 45: 140–202. ^ a b c d Castro, Alfonso Peter (1995). Facing Kirinyaga. London: Intermediate Technology Publications Ltd. ISBN 978-1-85339-253-5. ^ a b c Dutton, E.A.T. (1929). Kenya Mountain. London: Jonathan Cape. ^ a b Niemelä, Tuomo; Pellikka, Petri (2004). Zonation and characteristics of the vegetation of Mt. Kenya. Expedition Reports of the Department of Geography, University of Helsinki. 40. pp. 14–20. ISBN 978-952-10-2077-3. ^ a b Hedberg, Olov (1964). "Features of Afroalpine Plant Ecology". Acta Phytogeographica Suecica. 49: 1–144. ^ a b Smith, Alan P.; Young, Truman P. (1987). "Tropical Alpine Plant Ecology". Annual Review of Ecology and Systematics. 18: 137–158. doi:10.1146/annurev.es.18.110187.001033. ^ Young, Truman P.; Peacock, Mary M. (1992). "Giant senecios and alpine vegetation of Mount Kenya". Journal of Ecology. 80 (1): 141–148. Bibcode:2009JEcol..98...74B. doi:10.2307/2261071. JSTOR 2261071. ^ a b Young, Truman P.; Evans, M.E. (1993). "Alpine vertebrates of Mount Kenya". Journal of the East African Natural History Society. 82 (202): 154–79. ^ Musser, Guy G. & Carleton, Michael D. (2005). "Superfamily Muroidea". In Wilson, Don E. & Reeder, DeeAnn M. Mammal Species of the World: a taxonomic and geographic reference (3rd ed.). The Johns Hopkins University Press. pp. 894–1531. ISBN 978-0-8018-8221-0. ^ a b Hedberg, O. (1969). "Evolution and speciation in a tropical high mountain flora". Biological Journal of the Linnean Society. 1: 135–148. doi:10.1111/j.1095-8312.1969.tb01816.x. ^ Henne, Stephan; Wolfgang Junkermann; Josiah M. Kariuki; John Aseyo; Jörg Klausen (November 2008). "Mount Kenya Global Atmosphere Watch Station (MKN): Installation and Meteorological Characterization". Journal of Applied Meteorology and Climatology. 47 (11): 2946–2962. Bibcode:2008JApMC..47.2946H. doi:10.1175/2008JAMC1834.1. ^ Camberlin, P; Okoola, R. E. (2003). "The onset and cessation of the "long rains" in eastern Africa and their interannual variability". Theor. Appl. Climatol. 75 (1–2): 43–54. Bibcode:2003ThApC..75...43C. doi:10.1007/s00704-002-0721-5 (inactive 2018-11-11). ^ Thompson, B. W. (1966). "The mean annual rainfall of Mount Kenya". Weather. 21 (2): 48–49. Bibcode:1966Wthr...21...48T. doi:10.1002/j.1477-8696.1966.tb02813.x. ^ Spink, Lieut.-Commander P. C. (1945). "Further Notes on the Kibo Inner Crater and Glaciers of Kilimanjaro and Mount Kenya". Geographical Journal. 106 (5/6): 210–216. doi:10.2307/1788958. JSTOR 1788958. ^ a b Beck, Erwin; Ernst-Detlef Schulze; Margot Senser; Renate Scheibe (1984). "Equilibrium freezing of leaf water and extracellular ice formation in Afroalpine 'giant rosette' plants". Planta. 162 (3): 276–282. doi:10.1007/BF00397450. PMID 24253100. ^ Hastenrath, Stefan (1984). The Glaciers of Equatorial East Africa. Dordrecht, Holland: D. Reidel Publishing Company. ISBN 978-90-277-1572-2. ^ "Sunset & sunrise calculator (altitude not taken into account)". Retrieved 3 June 2007. ^ a b c d Krapf, Johann Ludwig (1860). Travels, Researches, and Missionary Labours in Eastern Africa. London: Frank Cass & Co. Ltd.
^ Mackinder, Halford (1900). "A Journey to the Summit of Mount Kenya, British East Africa". The Geographical Journal. 15 (5): 453–476. JSTOR 1774261. It was the missionary Rebmann of Mombasa who, in 1848, first reported the existence of Kilimanjaro. In the following year his colleague, Krapf, saw Kenya from Kitui, a spot 90 miles south-east of the peak. ^ Krapf, Johann Ludwig (13 May 1850). "Extract from Krapf's diary". Church Missionary Intelligencer. i: 345. ^ von Höhnel, Lieutenant Ludwig; Teleki, Count Samuel (1894). Discovery of Lakes Rudolf and Stefanie. London: Longmans. ^ a b c d e f g h Mackinder, Halford John (May 1900). "A Journey to the Summit of Mount Kenya, British East Africa". The Geographical Journal. 15 (5): 453–476. doi:10.2307/1774261. JSTOR 1774261. ^ a b c d e f Burns, Cameron (1998). Kilimanjaro & Mount Kenya; A Climbing and Trekking Guide. Leicester: Cordee. ISBN 978-1-871890-98-3. ^ Benuzzi, Felice (2005) . No Picnic on Mount Kenya: A Daring Escape, a Perilous Climb. The Lyons Press. ISBN 978-1-59228-724-6. ^ Brandt, Anthony (May 2004). "Extreme Classics: The 100 Greatest Adventure Books of All Time". National Geographic Adventure. Archived from the original on 2 September 2004. Additional pages archived on 22 July 2004: Page 1, Page 2, Page 3, Page 4, Page 5. ^ "Aircraft flown off Mount Kenya". News. The Times (49451). London. 23 January 1943. col C, p. 3. ^ "Fire devours Kenya's ancient forests". Al Jazeera English. Retrieved 11 September 2013. ^ a b "Mount Kenya Online Climbing Guide". Archived from the original on 14 February 2008. Retrieved 19 May 2009. ^ "Diamond Couloir Still Climbable". Archived from the original on 19 January 2011. Retrieved 11 July 2010. ^ a b c "Mount Kenya Online Trekking Guide". Archived from the original on 17 December 2007. Retrieved 19 May 2009. ^ "Castle Forest Lodge". Archived from the original on 8 July 2011. Retrieved 19 May 2009. ^ a b "Fairmont Mount Kenya Safari Club". Retrieved 20 April 2017. ^ "Serena Mountain Lodge" (PDF). Archived from the original (PDF) on 19 October 2007. Retrieved 19 May 2009. ^ "Lake Rutundu Log Cabins on Mount Kenya". Archived from the original on 4 October 2007. Retrieved 19 May 2009. ^ Reader, John (1989). Mount Kenya. London: Elm Tree Books. ISBN 978-0-241-12486-4. ^ B. J. Ratcliffe (January 1943). "The Spelling of Kenya". Journal of the Royal African Society. 42 (166): 42–44. JSTOR 717465. Benuzzi, F. (1953). No Picnic on Mount Kenya. Lyons Press. ISBN 978-1-59228-724-6. Best, Nicholas (2014). Point Lenana. Thistle Publishing/Kindle Single. de Watteville, Vivienne (1935). Speak to the Earth. W W Norton and Co Inc. ISBN 978-0-39333-556-9. Fadiman J. (1993). When We Began, There Were Witchmen An Oral History from Mount Kenya. University of California Press. ISBN 978-0-520-08615-9. Retrieved 28 June 2011. Kenyatta, J. (1962). Facing Mount Kenya. Vintage Press. ISBN 978-0-394-70210-0. Mahaney, W.C. (1990). Ice on the Equator. Ellison Bay, Wisconsin, U.S.A: Wm Caxton Ltd. ISBN 978-0-940473-19-5. A full survey of the long glacial and periglacial reconstructive history of Mt. Kenya, its geological and environmental settings, sequences of paleosols (ancient soils) and their significance in understanding the multiplicity of glaciations. 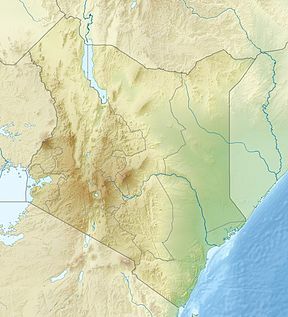 Wikimedia Commons has media related to Mount Kenya. "Mount Kenya National Park/Natural Forest". UNESCO World Heritage Centre. 2011. Retrieved 28 June 2011. "Mount Kenya Trust". Mount Kenya Trust. 2006. Archived from the original on 10 May 2015. Retrieved 28 June 2011. "Mt. Kenya National Park". Kenya Wildlife Service. 2011. Archived from the original on 25 January 2010. Retrieved 28 June 2011. "Mount Kenya, Kenya". Peakbagger.com. Retrieved 27 July 2013. "Mount Kenya Climbing Routes". 2014. Retrieved 1 October 2014. Mount Kilimanjaro, with its three volcanic cones, Kibo and Shira, is a dormant volcano in Tanzania. It is the highest mountain in Africa, and rises approximately 4,900 m from its base to 5,895 metres above sea level, the first recorded ascent to the summit of the mountain was by Hans Meyer and Ludwig Purtscheller in 1889. The mountain is part of the Kilimanjaro National Park and is a major climbing destination, the mountain has been the subject of many scientific studies because of its shrinking glaciers. Kilimanjaro rises approximately 4,900 m from its base in the plains near the municipality of Moshi to its summit height of 5,895 metres. Kilimanjaro is the highest volcano outside South America, Kilimanjaro is a large stratovolcano and is composed of three distinct volcanic cones, the highest, Mawenzi at 5,149 metres, and Shira, the shortest at 4,005 metres. Mawenzi and Shira are extinct, while Kibo is dormant and could erupt again, Uhuru Peak is the highest summit on Kibos crater rim. The Tanzania National Parks Authority, a Tanzanian governmental agency, and that height is based on a British Ordnance Survey in 1952. 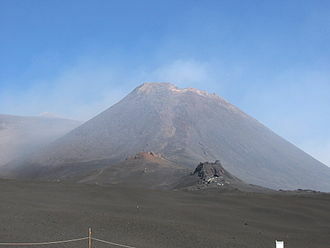 Since then, the height has been measured as 5,892 metres in 1999,5,891 metres in 2008, the interior of the volcanic edifice is poorly known, given the lack of large scale erosion that could have exposed the interiors of the volcano. Shira is topped by a plateau at 3,800 metres. The remnant caldera rim has been degraded deeply by erosion, before the caldera formed and erosion began, Shira might have been between 4,900 m and 5,200 m high. It is mostly composed of lavas with some pyroclastics. The formation of the caldera was accompanied by lava emanating from ring fractures, two cones formed subsequently, the phonolitic one at the northwest end of the ridge and the doleritic Platzkegel in the caldera centre. Both Mawenzi and Kibo began erupting about 1 million years ago and they are separated by the Saddle Plateau at 4,400 metres elevation. The youngest dated rocks at Mawenzi are about 448,000 years old, Mawenzi forms a horseshoe shaped ridge with pinnacles and ridges opening to the northeast which has a tower like shape resulting from deep erosion and a mafic dyke swarm. The Kikuyu are the largest ethnic group in Kenya. They speak the Bantu Kikuyu language as a mother tongue, the term Kikuyu is the Swahili form of the native pronunciation Gĩkũyũ. They are referred to as the Agĩkũyũ or Nyũmba ya Mũmbi meaning House Of The Potter or Creator, Gĩkũyũ literally means a huge sycamore tree and Agĩkũyũ thus literally refers to the children of the huge sycamore. According to the 2009 Kenya Population & Housing Census, there are an estimated 6,622,576 Gĩkũyũ people in Kenya, the nation of the Agĩkũyũ came from two original parents who were created by God, namely Gĩkũyũ and Mũmbi. The word Gĩkũyũ means a huge sycomore tree, Ngai refers to the creator who happens to be a life companion to the sycomore, the sacred tree from which the nation originated. The Kikuyu are of a Bantu people and they constitute the single largest ethnic group in Kenya, and are concentrated in the vicinity of Mount Kenya. The exact place that the Kikuyus ancestors migrated from after the initial Bantu expansion from West Africa is uncertain, until the arrival of Europeans, the Agĩkũyũ preserved geographic and political power from almost all external influence for many generations, they had never been subdued. Just before the arrival of the British, Arabs were involved in slave trade, slavery as an institution did not exist amongst the Agĩkũyũ, nor did they make raids for the capture of slaves. The Arabs who tried to venture into Agĩkũyũ land met instant death, relying on a combination of land purchases, blood-brotherhood, intermarriage with other people, and their adoption and absorption, the Agĩkũyũ were in a constant state of territorial expansion. Economically, the Agĩkũyũ were great farmers and shrewd businesspeople, besides farming and business, the Agĩkũyũ were involved in small scale industries with professions such as bridge building, string making, wire drawing, and iron chain making. The Agĩkũyũ had a sense of justice. The Agĩkũyũ nation was divided into nine clans, the members of each clan had a common maternal blood tie, but were not restricted to any particular geographical area, they lived side by side. Some clans had a leader, others did not. However, in case, real political power was exercised by the ruling council of elders. As of March 2016,669 biosphere reserves in 120 countries, including 16 transboundary sites, have been included in the World Network of Biosphere Reserves. Biosphere reserves are areas comprising terrestrial and coastal ecosystems, each reserve promotes solutions reconciling the conservation of biodiversity with its sustainable use. Biosphere reserves are nominated by governments and remain under the sovereign jurisdiction of the states where they are located. Their status is internationally recognized. The buffer zone surrounds or adjoins the core areas, and is used for activities compatible with sound ecological practices that can reinforce scientific research, monitoring and education. The transition area is the part of the reserve where the greatest activity is allowed, fostering economic, participating countries establish MAB National Committees that ensure maximum national participation in the international programme and implementing each country’s activities. MAB currently operates through 158 National Committees established among the 195 Members States, the agenda of the MAB Programme is defined by its main governing body, the International Coordinating Council. The MAB Council consists of 34 member states elected by UNESCO’s General Conference, the council elects a chair and five vice-chairpersons from each of UNESCO’s geopolitical regions, one of which functions as a rapporteur. Its staff members draw on expertise in many and varied disciplines, the programme can grant seed funding to assist countries in developing projects and/or to secure appropriate partnership contributions. The latest World Congress of Biosphere Reserves took place in Lima and this will be the 4th World Congress of Biosphere Reserves and it shall develop a new vision for the decade 2016–2025. The World Network of Biosphere Reserves is supported by different regional, sub-regional or thematic networks and these are as follows, The African Biosphere Reserves Network was created in 1996 and comprises 33 African countries. The ArabMAB Network was officially launched in 1997 and represents 18 Arab countries, the East Asian Biosphere Reserve Network was launched in 1994. Today, it consists of China, the Democratic People’s Republic of Korea, Kazakhstan, the Republic of Korea, euroMAB is the network of biosphere reserves in Europe and North America. Senecio /sᵻˈniːʃi. oʊ/ is a genus of the daisy family that includes ragworts and groundsels. The scientific Latin genus name, means old man, variously circumscribed taxonomically, the genus Senecio is one of the largest genera of flowering plants. The traditional circumscription of Senecio is artificial, being polyphyletic, even in its new circumscription which is based on genetic data, despite the separation of many species into other genera, the genus still contains c. 1250 species and is one of the largest genera of flowering plants. As no morphological synapomorphies are known to determine which species belong to the genus or not, the genus has an almost worldwide distribution and evolved in the mid to late Miocene. Some species produce natural biocides to deter or even animals that would eat them. Senecio species are used as food plants by the larvae of some Lepidoptera species — see list of Lepidoptera that feed on Senecio, pyrrolizidine alkaloids have been found in Senecio nemorensis and in Senecio cannabifolius var. integrilifolius. The flower heads are normally rayed with the heads borne in branched clusters, and usually completely yellow, in its current circumscription, the genus contains species that are annual or perennial herbs, small trees, aquatics or climbers. The only species which are trees are the species belonging to Robinsonia occurring on the Juan Fernández Islands. The genus Senecio is distributed almost worldwide and it is one of the few genera occurring in all five regions with a Mediterranean climate. Furthermore, species are found in regions, including tropical alpine-like areas. Many genera and the tribe are in need of revision. Many species actually being placed in the genus need to be transferred to other or new genera, in its new delimitation the genus is still not monophyletic. Genera that have included are the following, Aetheolaena Culcitum Hasteola Iocenes B. Robinsonia The following genera contain species that are or have been included within Senecio, & Brettell Brachyglottis J. R. Forst. - Giant groundsels occurring in the high areas of East Africa Dorobaea Cass. Löve & D.
Mackinder was born in Gainsborough, England, the son of a doctor, and educated at Queen Elizabeths Grammar School, Epsom College and Christ Church, Oxford. At Oxford he started studying natural sciences, specialising in zoology under Henry Nottidge Moseley and he was a strong proponent of treating both physical geography and human geography as a single discipline. Mackinder served as President of the Oxford Union in 1883 and he received a degree in biology in 1883 and one in modern history the next year. In 1887, he published On the Scope and Methods of Geography, a few months later, he was appointed as Reader in Geography at the University of Oxford, where he introduced the teaching of the subject. As Mackinder himself put it, a platform has given to a geographer. This was arguably at the time the most prestigious position for a British geographer. In 1892, he was the first Principal of University Extension College, the college became the University of Reading in 1926, a progression that owed no small debt to his early stewardship of the institution. In 1893, he was one of the founders of the Geographical Association and he became chairman of the GA from 1913 to 1946 and served as its President from 1916. In 1895, he was one of the founders of the London School of Economics, at Oxford, Mackinder was the driving force behind the creation of a School of Geography in 1899. In the same year, he led an expedition which was the first to climb Mount Kenya, in 1902 he published Britain and the British Seas, which included the first comprehensive geomorphology of the British Isles and which became a classic in regional geography. He was a member of the Coefficients dining club, set up in 1902 by the Fabian campaigners Sidney and Beatrice Webb, in 1904 Mackinder gave a paper on The Geographical Pivot of History at the Royal Geographical Society, in which he formulated the Heartland Theory. This is often considered as a, if not the, founding moment of geopolitics as a field of study, whilst the Heartland Theory initially received little attention outside geography, this theory would exercise some influence on the foreign policies of world powers. They are known generally as lobelias. The genus Lobelia comprises a number of large and small annual and shrubby species and tender, from a variety of habitats. Many species appear totally dissimilar from each other, all have simple, alternate leaves and two-lipped tubular flowers, each with five lobes. The upper two lobes may be erect while the three lobes may be fanned out. Flowering is often abundant and the flower colour intense, hence their popularity as garden subjects. The genus is named after the Belgian botanist Matthias de Lobel, some botanists place the genus and its relatives in the separate family Lobeliaceae, others as a subfamily Lobelioideae within the Campanulaceae. The Angiosperm Phylogeny Group did not make a decision on this. Lobelia is probably the form from which many other lobelioid genera are derived, it is therefore highly paraphyletic. Lobelia species are used as food plants by the larvae of some Lepidoptera species including the Setaceous Hebrew Character, several species are cultivated as ornamental plants in gardens. Lobelia fulgens, Lobelia siphilitica, and Lobelia erinus, which is used for edging, numerous hybrids have been produced, notably Lobelia × speciosa, a hybrid derived from L. fulgens, L. cardinalis & L. siphilitica. The term fan hybrids is used and this plant is borderline hardy and requires fertile, moist soil. It is suitable for summer bedding schemes or growing in containers, the following cultivars have gained the Royal Horticultural Societys Award of Garden Merit, - Native Americans used lobelia to treat respiratory and muscle disorders, and as a purgative. The species used most commonly in modern herbalism is Lobelia inflata, there are adverse effects that limit the use of lobelia. Lobelia has been used as asthmador in Appalachian folk medicine Two species, L. siphilitica, herbalist Samuel Thomson popularized medicinal use of lobelia in the United States in the early 19th century, as well as other medicinal plants like goldenseal. The eccentric New Englander Elias Smith, a preacher and alternative medicine advocate, a unique feature of Smiths system was the identification of Lobelia with the plant of renown referred to in Ezekiel 34,29. Several types of volcanic eruptions—during which lava and assorted gases are expelled from a volcanic vent or fissure—have been distinguished by volcanologists. These are often named after famous volcanoes where that type of behavior has been observed, some volcanoes may exhibit only one characteristic type of eruption during a period of activity, while others may display an entire sequence of types all in one eruptive series. There are three different types of eruptions, the most well-observed are magmatic eruptions, which involve the decompression of gas within magma that propels it forward. Phreatomagmatic eruptions are another type of eruption, driven by the compression of gas within magma. Within these wide-defining eruptive types are several subtypes, the weakest are Hawaiian and submarine, followed by Vulcanian and Surtseyan. 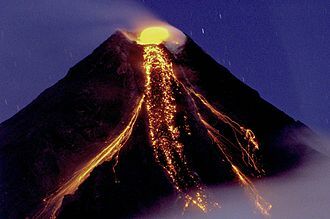 The stronger eruptive types are Pelean eruptions, followed by Plinian eruptions and phreatic eruptions are defined by their eruptive mechanism, and vary in strength. An important measure of strength is Volcanic Explosivity Index, an order of magnitude scale ranging from 0 to 8 that often correlates to eruptive types. Explosive eruptions are characterized by gas-driven explosions that propels magma and tephra, effusive eruptions, are characterized by the outpouring of lava without significant explosive eruption. Volcanic eruptions vary widely in strength, on the one extreme there are effusive Hawaiian eruptions, which are characterized by lava fountains and fluid lava flows, which are typically not very dangerous. On the other extreme, Plinian eruptions are large, volcanoes are not bound to one eruptive style, and frequently display many different types, both passive and explosive, even the span of a single eruptive cycle. Volcanoes do not always erupt vertically from a crater near their peak. Some volcanoes exhibit lateral and fissure eruptions, many Hawaiian eruptions start from rift zones, and some of the strongest Surtseyan eruptions develop along fracture zones. The Kibo summit of Mount Kilimanjaro. 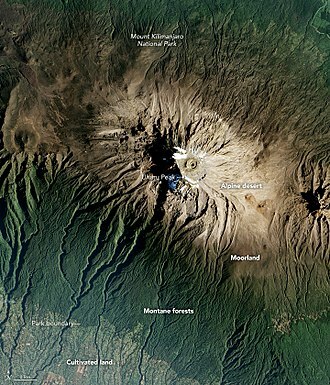 Mount Kilimanjaro from space, illustrating its diverse vegetation zones. Two of Kilimanjaro's volcanic cones: Kibo (left) and Mawenzi (right). 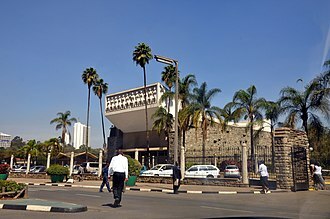 The National Assembly of Kenya. A Kenyan private security officer. 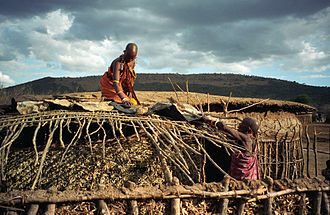 Basket-weaving, one of the traditional skills of the Kamba. Senecio vulgaris, an illustration from 1885.